Welcome to the New Stampin' Up! 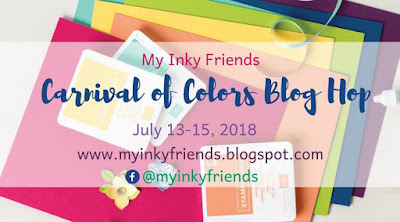 Carnival of Colors Blog Hop! We're highlighting our favorites for you, so be sure to click through all the posts. 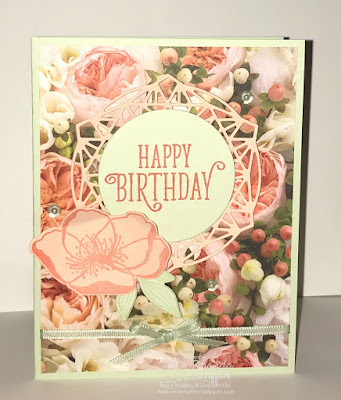 If you've been traveling in order, you might have arrived from Sharleen's Stamp with Shar Blog where she showed how lovely Pineapple Punch can be. I chose Soft Sea Foam because I enjoy how light and fresh it is. The color is so airy and soft that I really wanted to use it with the Petal Promenade Designer Series Paper. The contrast with the lovely pinks is soothing. Happily, it has matching adhesive back sequins, and I put a small pearl in the center of each to soften the look even further. Several pieces of the Petal Promenade sweet add nice details to the card, but I wanted a fun Happy Birthday rather than a serious sentiment. The Happy Birthday from the Happy Birthday Gorgeous! set was just what I imagined in Flirty Flamingo. Unfortunately, we do not have a Soft Sea Foam Ribbon, so I made my own with the Light Soft Sea Foam Blends marker and the 1/8 inch Whisper White sheer ribbon. It's so quick and adds so much! I just colored it gently on both sides being careful to use the side of the marker rather than the tip. 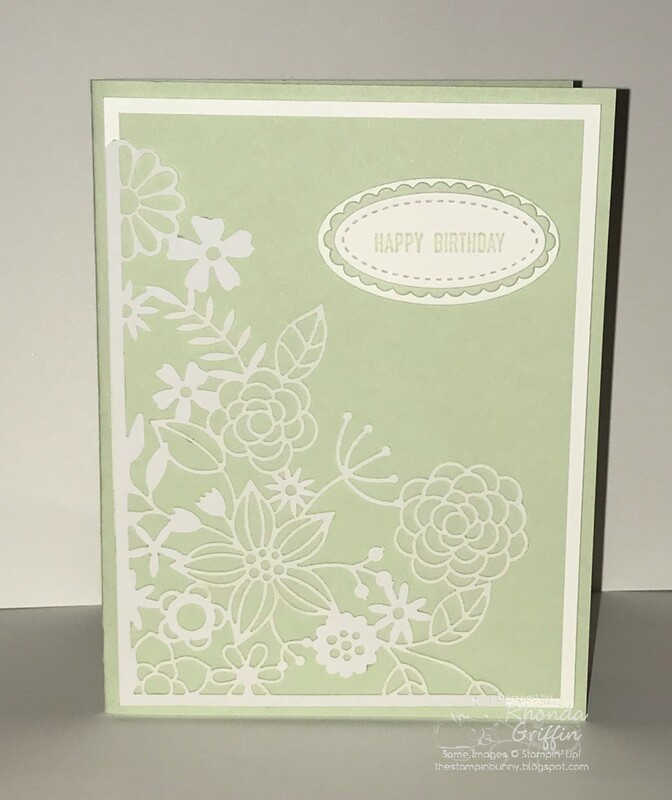 For the next card, I used the Delightfully Detailed Laser Cut Specialty Paper as a corner accent for a monochromatic card. It was simple to adhere the flowers with Mono Multi Glue. 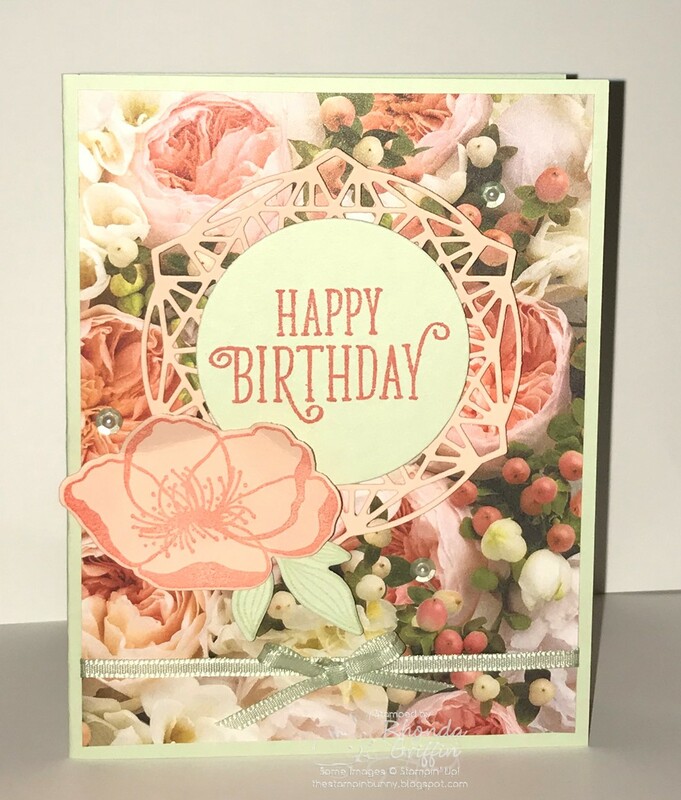 Now we'll travel to Betty's Kitty Stamp Blog to see her sweet Petal Pink designs. July Designer Series Paper Sale from Stampin' Up!